A recommendation (RECO) from me. My review forthcoming. 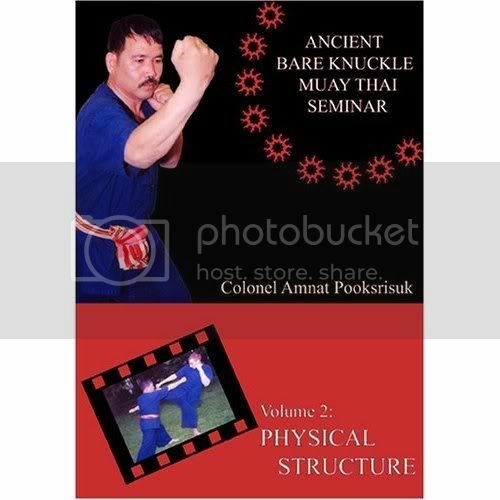 The Ancient Bare Knuckle Muay Thai Physical Structure DVD focuses on the myriad of tactics and fighting strategies of the various regional bare knuckle systems that existed in Thailand when bare knuckle fighting flourished throughout the kingdom. The original tactics were then synthesized and streamlined into what we know of as the popular sport of ring Muay Thai. In this second volume devoted to physical structure, the viewer is introduced to the extensive arsenal of the bare knuckle toolbox that are then developed through a series of unique physical foundation skill development exercises that enhance and functionalize them. Beginning with the warm up sequence into the extensive kicks, punches, knees and elbows, the teaching sequence accelerates into footwork, line drills, using the triangle, varied offensive and defensive strategies on the inside and outside lines, the art of opening, sinking, moving the mind to open the target as well as a deeper understanding of the Khorat style tiger walk and the Chaiya style lion walk and the ability to translate basic weapons tactics to empty hand strategy. Each volume in this series stands on its own though they are designed specifically to work in tandem as a clear progressive teaching guide that will benefit both beginner and advanced martial arts practitioners. Colonel Amnat Pooksrisuk has devoted his entire life to the preservation and propagation of the complete spectrum of Thai Martial Arts as well as the strategies and principles that govern them. A graduate of US War College and a career military man, he has tirelessly trained and documented many of the ancient and modern training methods under the last remaining Grandmasters throughout Thailand. A key figure in the World Muay Thai Council, he continously works to promote Muay Thai throughout the world. Ajarn Pooksrisuk is one of the few remaining masters who possesses the knowledge of how the Pichai Songkram or Thai Manual of Warfare provides the keys to understanding the underlying principles that govern all the Thai Martial Arts. "Colonel Amnat's "Ancient Bareknuckle Muay Thai" series is a must for any serious martial artist or fighter. For the novice, the Colonel clearly and concisely presents Muay Thai in its most basic form, laying down a foundation upon which the entire art is built. For the experienced practitioner, the lessons contained within these DVD's begin to tie the varying systems of Muay Thai together into a single, cohesive style of fighting."